Description: Each 2 lb package contains ~16 Brookelyn Dogs. (Product packaged by weight.) 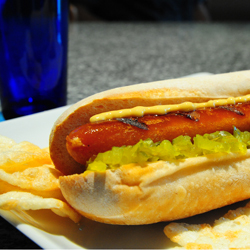 Get that summertime feeling with these delicious Brookelyn Dogs, our veggie hot dog taste-a-likes. These low fat, hi fiber, low protein dogs are sure to be a family favorite! Contains 32 mg of DHA Omega 3's per serving. Stove top (preferred method): If frozen, thaw first. Preheat oiled skillet on low to medium heat. Place Brookelyn Dogs in skillet and cook until evenly browned on all sides and heated through, 4 to 5 minutes. Microwave: Wrap frozen Brookelyn Dog in paper towel; heat 30 to 35 seconds on high. Serving Suggestions: Serve for lunch or dinner or in any recipe as a meat substitute. Ingredients: Yuca (yuca, salt), water, inulin, sweet potatoes, red bell peppers, natural lamb casing, artificial flavoring (salt, hydrolyzed soy protein, silicon dioxide, glycerol triacetate, vitamin B1), salt, DHA algal oil (high oleic sunflower oil, sunflower lecithin, tocopherols [antioxidant], ascorbyl palmitate [antioxidant]), caramel color (preserved with sulfites). Contains soy.